When the casino law was passed, allies of the racing industry tried to spin the fund as something other than a special-interest giveaway by claiming it served the broader public interest in preserving open space on horse farms. Jones’s proposal would be a step in the right direction, but the state’s ultimate goal should be to wean horse racing off state support completely. The collapse of horse racing has inflicted undeniable pain on many workers in Massachusetts, and they deserve the Commonwealth’s full support making a transition to more viable jobs. But simply paying them to run horses in front of ever-shrinking crowds — at Suffolk Downs, in New York, or anywhere else — is not a long-term economic policy. And I wrote in 2014 that the legislature would come for the RHDF. Much like last year’s revised split that increased standardbreds’ share of the RHDF from 25% to 55% — Plainridge is running 125 days with average daily purses of $60K and a $250,000 stakes race in 2017 thanks to the boost — the proposed appropriation in the 2018 budget bill is being sold as a temporary way to put the fund to use — it’s for one fiscal year only — except that legislators, whether or not the budget passes as currently written, aren’t likely to forget that the RHDF money is there. The fund will become an even more tempting target for raids when the Springfield MGM casino opens in 2018 and a percent of its revenue begins to swell the RHDF. The New England Horsemen’s Benevolent and Protective Association, for example, makes the case that the money in the fund was intended to promote horse racing. What better way to promote horse racing than to promote a horse park with a track, officials said. Now, silly us for raising a question like this, but if Suffolk Downs couldn’t make a go of thoroughbred racing a stone’s throw from downtown Boston, why on earth would the state want to invest its money in such a venture, say in maybe a town like Spencer? And calling horse racing an “industry” does not make it so. Like we’ve never heard that one before! Until lawmakers find a better use for the racing fund it will continue to attract nutty schemes like this one. he supported legislation that would reform the horse racing industry and give it a better chance of success in Massachusetts … taking away the fund would be the “death knell” for racing in the Commonwealth. The death knell is sounding — the obstacles to the NEHBPA horse park are substantial, Brockton is not viable, and the state of the larger racing industry is against new construction or a new track operator entering Massachusetts. Brian Hickey, the association’s lobbyist and the host of Thursday’s presentation, said the group would like to see the law changed so the money in the Horse Race Development Fund could be used to directly support the state’s horse-racing industry. He estimated a couple hundred thousand dollars would be needed for the horse park feasibility study, and indicated more of the money would be needed if the horse park itself moves forward. He said revenues from simulcasting races from around the country could also be used to support the park. [Michael] Blowen, who labored in the barn for two years without ever seeing a paycheck, has many fond memories of his former mentor and holds him close in his heart. “We have a horse here at Old Friends named Summer Atttraction, who I think just turned 23, that I owned. Carlos ran him as a 2-year-old in a two-furlong maiden race at Suffolk Downs in a four-horse field in 1997 on a big day. One of the other horses was owned by Jim Moseley (Suffolk’s late track owner and a prominent owner and breeder) and that horse cost over $200,000. Summer Attraction, whom I paid $5,000 for, won. “So Carlos decided to next run him at Saratoga in the Sanford (G3). The race came up so tough that Favorite Trick (eventual 2-year-old champion and 1997 Horse of the Year) scratched out of it. Trainer Carlos Figueroa, wearing a panama hat and a red polo shirt, is standing on top of a yellow tractor on the infield shouting at the top of his lungs, “Quatro, quatro, quatro,” as the horses in the eighth race at the Three County Fair in Northampton turn for home. This is no ordinary race. It is the second leg of the Lancer’s Triple Crown, a series of races running from late August through late September that is as important to Figueroa as the Kentucky Derby, the Preakness and the Belmont are to Woody Stevens. And the horseman is trying to scream home his entry, Icy Defender, No. 4. Figueroa, who looks as if he could play Juan Peron in “Evita,” won the first leg two weeks earlier at the Marshfield Fair with Cheers n’ Tears, a 5-year-old who worked his way down the Suffolk Downs claiming ladder from $6500 on the Fourth of July to $3000 on Aug. 9. He received his trophy and had his picture taken by the track photographer just a few hours before the lady mud wrestlers and fireworks display took over the infield. … in 1963 Figueroa entered … Shannon’s Hope a total of eight times in 13 days and won five straight at distances from about 5 furlongs to about 6 1/2 furlongs. The saga of Shannon’s Hope began August 12 when he finished fifth at the Weymouth Fair. The next day he finished third and two days later he was fourth. Then Shannon’s Hope began his hot streak. He won closing day at Weymouth on August 17 and moved to the Marshfield Fair on August 20 where he was a five length winner. He then won at Marshfield on three successive days (August 22-24) by a total of nine lengths. The state racing commission cited his reputation and record — he had never been suspended before — as a reason for reducing his days. “I don’t think he had anything to to do with [the positive],” said one of the commissioners. Figueroa, “a fixture at Suffolk since the 1950s,” started his last horse at the East Boston track on November 13, 2010. His career stats on Equibase only go back to 1976 — between that year and his retirement, he won 846 races from 9,841 starts, earning more than $4.1 million. 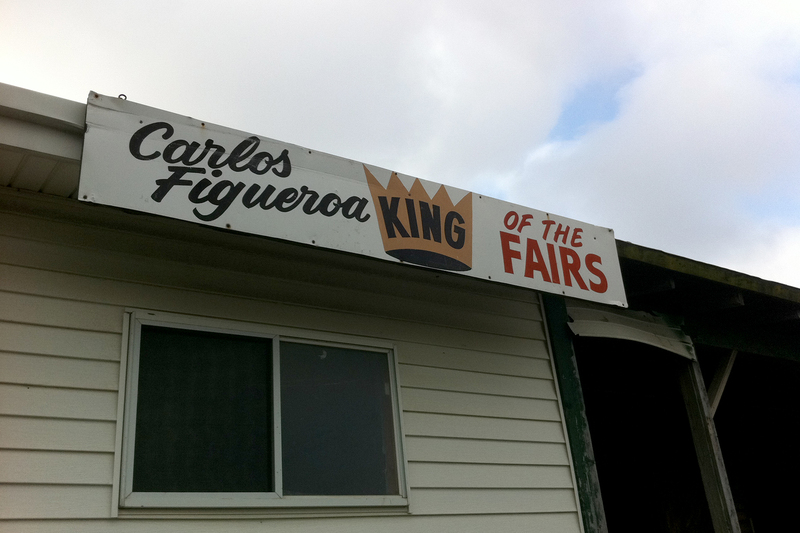 For anyone who knew Figueroa at Rockingham Park and Suffolk Downs, the two main tracks at which he was stabled for decades, conversations with “King Carlos” often involved being shouted at in heavily accented English while trying to avoid his wildly gesticulating arms. He was forever phoning the Suffolk press box with good-natured demands for publicity and press coverage, and Figueroa liked to regale anyone who would listen with outlandish, difficult-to-document claims, like the time he allegedly singled all the winners in the very first Pick Six in the country when Rockingham offered the bet in the 1960s. Let’s talk about the New England HBPA proposal for a non-profit horse park, a multi-use complex comprising a racetrack, an equestrian center, and a retirement farm. The group released a feasibility study authored by the Center for Economic Development at the University of Massachusetts-Amherst late last week (PDF), which concluded that such a facility — a “truly unique” model — would have an annual economic impact of $98.9 million on the Massachusetts economy. More than $66 million would come from the Thoroughbred racetrack, $31.7 million from the equestrian center. More details about the equestrian center and the proposal’s numbers can be found in the Blood-Horse and Daily Racing Form articles about the study. [The economic impact totals] are built on the following assumptions: 75 racing days during a typical season between May and October; 9 races per day; 800 horses in residence throughout the season; an average of 3,000 spectators per race day; and an out-of-state attendance rate of 20 percent. The center will feature a one-mile dirt oval racetrack designed for the safest possible racing of Thoroughbred horses for a 60-90 day season per year. This track could also serve as a venue for Standardbred horse racing if there is interest. Within the oval is a 7/8 mile turf course. Overlooking the track will be a viewing stand capable of seating 4,000 patrons. Within this facility will be restaurants and local wagering areas. We assume that the present purse subsidies and breeding program established under the Expanded Gaming Act of 2011 will continue in their present form. So, a conventional track (aside: if you’re building a new racetrack “designed for the safest possible racing of Thoroughbred horses,” shouldn’t the main track be a turf course? ), with a smaller grandstand (realistic) and a lot of Mass-bred racing supported by Race Horse Development Fund-subsidized purses. This is an underwhelming vision, and that matters because Massachusetts racing and breeding is not isolated from the larger national market, and because financing the horse park development will depend on bonds backed by the state’s Race Horse Development Fund (legislation pending). There’s compelling public interest, in other words, in proposing a racetrack that reaches for the highest level, in the same way that the proposal does for the equestrian center, described in the report as “a first-class facility,” “capable of hosting elite national events.” Modeled on the Virginia Horse Center and Kentucky Horse Park, it’s supported by a Rolex Kentucky case study. No racetrack case study is included in the report. There isn’t even an aspirational mention of an elite track such as Keeneland or Saratoga — although, as models, both have something to offer a new track proposal, particularly in what they do to draw spectators (one of the goals of the horse park) and to support state breeding programs and horse sales (another goal). I don’t want to leave the impression that I’m down on the NEHBPA proposal — it’s interesting and full of potential, especially for drawing together equestrian and racing interests. But it’s an odd thing to read a study promoting a horse park for the good of horse racing (and breeding and jobs) that makes you wonder — why is there horse racing? And gives you the answer — because that’s the mechanism for accessing Race Horse Development Fund money. Horses race because the RHDF pays, the RHDF pays to keep horses racing. There’s no customer, no horseplayer, and no fan or handle growth in that perfect little circle of horsemen and state money. It’s not enough. … the remaining 10 percent of foals are sold out-of-state at the national average auction price. Over the past three years, the average sale price from two-year old horses was approximately $70,000 per horse according to statistics from the U.S. Jockey Club. Thus, we include an addition $805,000 per year for expanded out-of-state horse sales. Average prices being skewed by the market’s top end, the median price may be a better measure of how Mass-breds might do at auction. For 2-year-old horses in the past three years, the median has run around $31,000-$32,000, which would equal approximately $364,205 in expanded out-of-state sales. using a 2yo sale for projecting sales is not realistic. A yearling sale should be used, because 2yo sales are specialist events. no one, in other words, breeds horses to sell at 2yo sales. Sellers of 2yos are usually second owners of horses. …have enough expertise to explain the mechanisms of all of this, good and bad, real and perceived. …local stallion. That’s why states incentivize local stallions, to keep mares in state. programs fertility rates are about 50-55%, so need to effectively double mares to get 115 foals. Additional mares would boost the estimated job and farm spending figures. *Fernando’s account is private. He gave permission to quote the tweets above.